Meg and Jeff gave George a gorgeous telescope for Christmas this year and it looks so good in the living room - I think it will be used quite often this summer checking out the passing boats. The color of the wood is perfect in the room and the brass looks great- at least until we have to polish it! The newly framed picture of the side garden looks great- finally hung in the foyer. It is a print from the Penobscot Bay Maritime Museum Glass Plate Archives. What a find- I was thrilled to find something that showed the side of the house - we had nothing to show the gardens and it will come in handy when we are trying to bring the house back to its original look. This shot is of Grey Gardens in the Hamptons, NY. - the famous house lived in by the Beales- relatives of Jackie Kennedy. It has been gorgeously restored by Sally Quinn and Ben Bradlee of the Washington Post. I thought we should be removing the wallpaper in the whole house but when I see this gorgeous treatment - I could be convinced otherwise!!! Love the blue and white stripe. Our staircase - we need to get working on what we want here! I think the tile house portrait over the mantle in the dining room looks great- what a great treat from our trip to Portugal! The new altar table and mirror over it were put in place this weekend- I am sure you could hear George when he was hanging this huge and very heavy mirror- it was a bear! Got some very rugged candlesticks that I think are a good size for the room - my biggest problem is always in scale- small things look really small and insignificant. I always need to buy BIG! Nan's beautiful soup tureen looks great on the table - would look even better with some lobster bisque in it!!! I think this altar table will hold a lot of side dishes at Thanksgiving and be great as a server year round! wait, wait, wait. omg omg omg - is this your house??????????????????????? be still my heart! 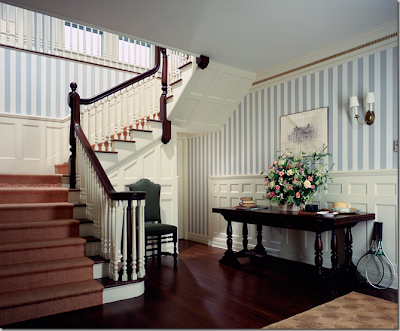 you HAVE to put striped wallpaper in the hall like GG!! you have to!!! Wow Cote de Texas commented on my blog!!!! I am crazy about her site, her taste, everything!!!! What a coup! I will have to ramp it up at the house- she'll be watching!!! A fellow Maine blogger- such a treat. Gorgeous home there in Belfast. There is a Home Goods in Portland- I hope the sun is out there this morning-it's lovely here. Fun time at the Nationals Game!